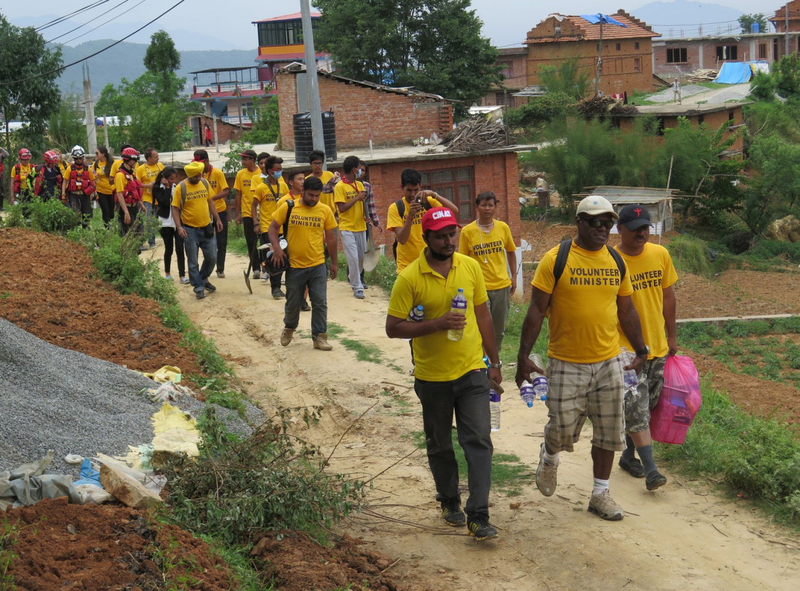 A team of Scientology Volunteer Ministers arrived in the Kavrepalanchowk district of Nepal this week to provide medical care and protection from the elements. 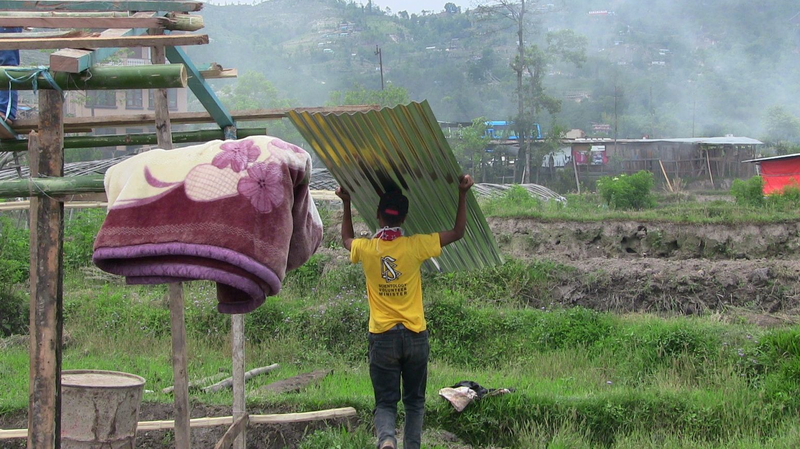 A Volunteer Minister carries a sheet of metal for use in constructing temporary housing to the site where the structure will be built. 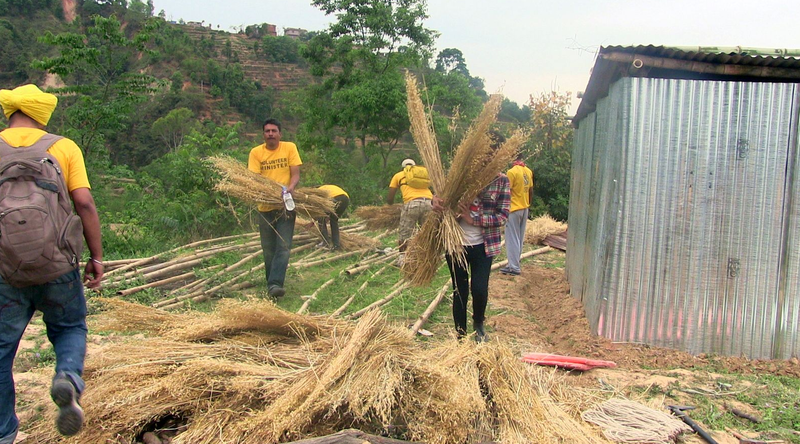 Volunteer Ministers clearing the land so temporary housing be built in a village in Nepal. A doctor who is also a Scientology Volunteer Minister dressed this man’s wounds and then gave him a Scientology assist—a technique that helps speed healing by addressing the emotional and spiritual factors in injuries and illnesses. 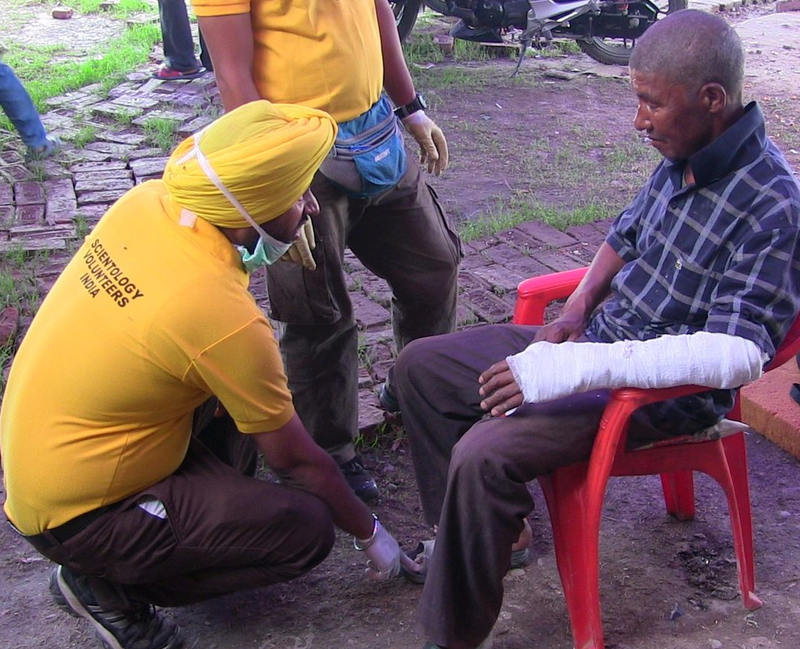 Another Scientology Volunteer Minister, a medical doctor from India, administers a Scientology assist while showing other villagers how, so they can help others in their village with this technique. 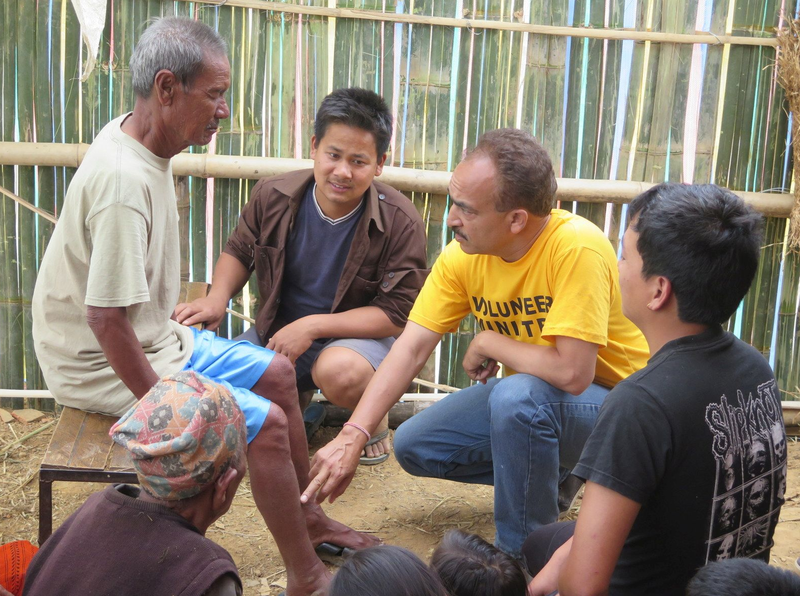 Rainy season begins in June and hundreds of thousands are still without shelter after the April/May earthquakes and aftershocks. 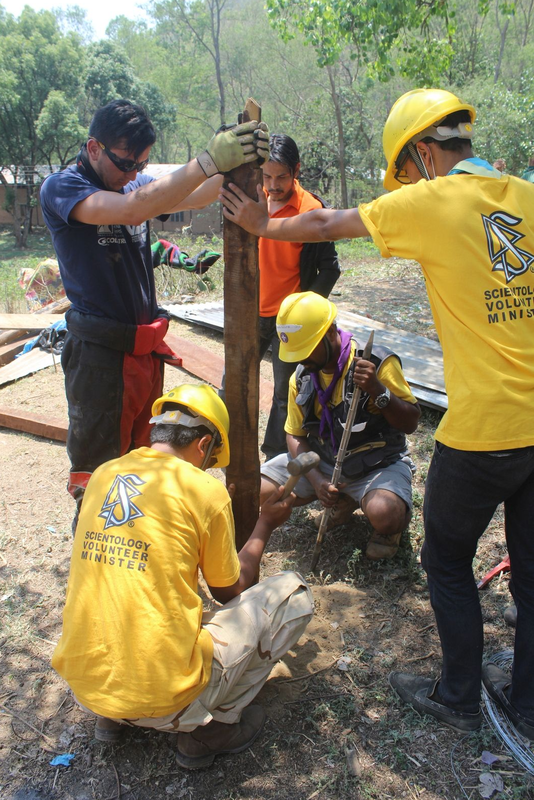 Scientology Volunteer Ministers teams are building tents and temporary housing to help provide protection from the elements. It is a typical example of the ruthlessness of this month of earthquakes and aftershocks—villagers in the Kavrepalanchowk district are living in the open, afraid to go back into the buildings that used to be their village—and rightly so. The earthquakes and aftershocks have seriously damaged or destroyed an enormous number of buildings. And while coping over the past four weeks has been hard but not impossible—April through early June being the season when the weather is dry and warm—the situation is fast approaching a crisis. Rainy season means monsoons, and this typically begins very soon and lasts until September. In addition to their needing shelter, in the weeks since the original temblor struck, many villages, remote from Kathmandu, have not had the benefit of medical care. So the team of Volunteer Ministers who left for the region this week were equipped not only to build tents and temporary housing, they also included a team of medical doctors from India and Pakistan and paramedics from Colombia, brought to Nepal by the Scientology Volunteer Ministers Disaster Response to help fill the gap in an overtaxed and undermanned medical infrastructure. When the medical tent was set up, one of the villager arrived in tears, still traumatized by the loss of her husband in the earthquake. A series of Scientology assists helped her so much, she asked to be trained to deliver assists herself so she could help other members of her village.